Have questions about your car battery? American Eagle Towing can answer them. A car mechanic replaces a battery. As much as we would all like our car’s battery to last a lifetime, unfortunately, they don’t. They will get old and inevitably give out on you. To avoid this fate, you’ll want to replace your battery. But how do you know when it’s the right time to replace a battery? Not only that, but is there a way to tell your battery is failing before it does? What about the cost of the battery, or a battery’s longevity? These are all good questions, all very much deserving of answers. Here we at American Eagle Towing will answer these questions and more. How do I know if my battery is failing? While there’s not one universally recognized sign that lets you know it’s time to change your car battery, there are indicators that your battery is about to go. 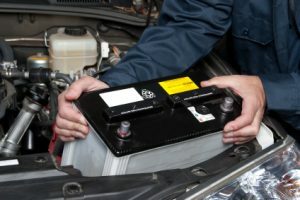 For example, if your car is having trouble starting, or the engine is turning over slower than it once did, this could be an issue with the battery. Another sign is if your interior lights flicker, or are dimmer than they once were. The lack of juice can often be attributed to a weak battery. Yes. 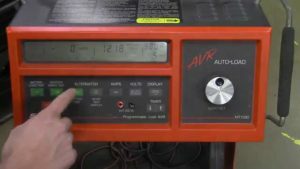 Many auto shops or mechanics have battery load testers. Not only can these devices test a battery’s condition, but they can also test the starting and charging system, according to testingautos.com. The best times to have your battery tested is and the beginning of summer, and the beginning of winter. Extreme temperatures cause most marginal batteries to fail. Most places will charge you anywhere from $30-$60 for this service. Contact American Eagle Towing today to get a quote. How expensive is it to get a new battery? If you’ve determined you need a new battery, you’ll likely want to get an idea of how much it’s going to cost you. A new battery will typically cost anywhere from $75-$130, with an additional fee of up to $80 for installation. If you want to save on installation fees, you can install a battery by yourself. However, doing so poses risk of injury, as old batteries can be very acidic. It would be wise to contact your local auto shop to do it for you. We recommend Interstate Batteries, due to their superior warranties. Does the battery need maintenance? You have a new battery and you don’t want to get another one any time soon. Naturally, you wonder if any maintenance is needed in order to assure this. Fortunately, most modern batteries are maintenance free. To verify this, you can check your car’s owner’s manual. If you’re still unsure after that, contact us at American Eagle Towing for help. Having a battery die on you is never fun. However, by following the guidelines above, you’ll be sure you not only get the most out of your battery. Browse our website for more information, or contact us at American Eagle Towing to get a quote on a battery or any of our car towing services! We’re an authorized dealer of Interstate batteries, and can actually bring one to you where you need it. In most vehicles, we also offer installation service. Call us today at 405.948.0008!